I love my Keurig coffee maker! I can have a cup of dark-roast early in the morning, and then my mid-morning light-roast without having to brew two separate pots. Mine will also brew carafes of coffee if needed. The Keurig is the best invention since sliced bread! However, there are a lot of different Keurig models out there. Finding the best Keurig coffee maker can be difficult. 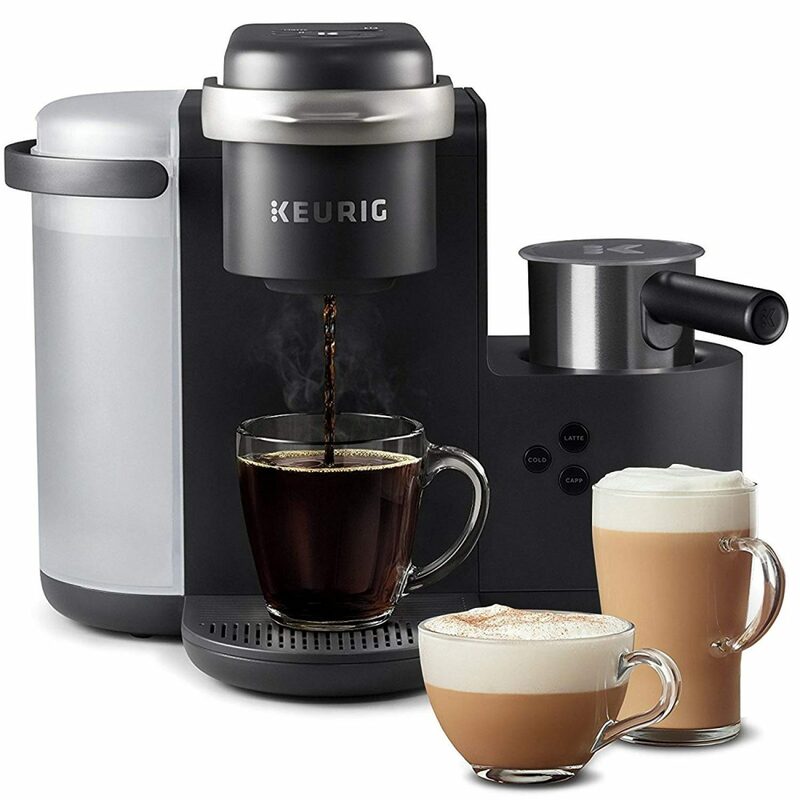 We have picked the top 5 Keurig coffee makers and will review them for you below. This Keurig coffee maker has many options. It allows you to make cappuccinos and lattes! No more $6 Starbuck trips! It comes with an easy-to-clean, dishwasher-safe frother so you get to choose how much foamy milk you want. You can set the brew size and get 6, 8, 10 and 12 oz beverages. Travel mugs up to 7.2 inches tall are accommodated; and you can also have bolder taste by adjusting the strength of your beverage. A large-size water reservoir (60 oz.) eases the process of brew for 6 cups before it needs to be refilled. The auto power-off feature makes it possible to leave the coffee maker on, as it turns off automatically after 2 hours of being idle. However, you can disable the auto-off feature and keep it on if you want. If you are like me and hate the waste of the pods- this Keurig coffee maker can use the Keurig My K-Cup Universal Reusable Coffee Filter. It is also compatible with all Keuring K-Cup pods so you can have hot chocolate and different teas. It really is the top-of-the-line model! This Keurig coffee maker has a large, easy-to-remove water reservoir (80 oz.) so you can have at least 10 cups of coffee before easily removing and refilling the reservoir. This Keurig coffee maker also can brew carafes of coffee. Using K-Carafe pods, each containing up to 26 grams of coffee, it is possible to brew 22, 26 and 30 oz carafes. 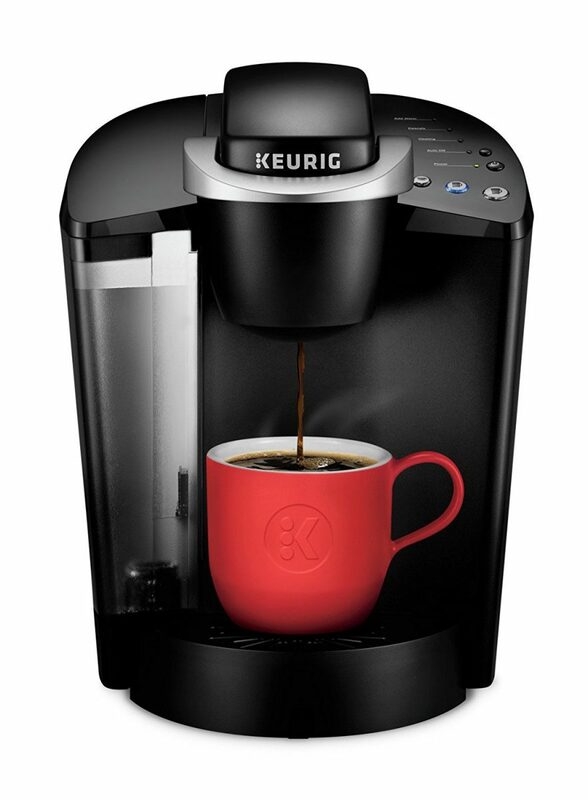 Having any size of coffee, using K-cup, K-Mug and K-carafe pods, is as easy as pressing a button. K-cup pods are available in different brands for various beverages including coffee, tea, and hot chocolate. The settings are automatically changed by identification of the pack inserted, in order to brew the best quality coffee. However, strength control and temperature setting features makes it possible to have bolder coffee with your five favorite temperatures. You can also get hot water. The digital clock on its touch screen provides the possibility not only to brew your coffee within less than a minute but to set automatic on-off times. + Various coffee sizes up to 30 oz. This Keurig coffee maker is the classic. It is basic, but makes a great cup of coffee! The reservoir (48 oz.) allows you to brew at least 6 cups of coffee before you have to refill. It also offers the possibility of using various sizes of K-Cup Pods (6, 8, 10 oz.) by its simple icons and indicator lights. The 6-oz pods will give you the strongest coffee. It comes with two useful features: Descaling process to remove scale accumulated in the coffee maker over time (recommended every 3-6 months) and auto-off feature to let you program the device to turn off after 2 hours of the last brew. As the name suggests, this Keurig coffee maker is best for the office. It has a full-color touch screen to adjust the temperature, language (Spanish, English and French) and auto on-off. The large, 90 oz. reservoir makes it possible to brew up to 18 cups of coffee before you remove and refill it easily, while providing the possibility to brew four different sizes of coffee, ranging from 4 oz. to 10 oz. with various strengths and tastes. It makes different beverages with any K-Cup Pods. Run it with no k-Cup Pod and the output is hot water. A removable drip tray and drainable internal hot water tank allows not only the use of mugs, but easy transport and storage. This model is not designed to be plumbed directly, unless you buy a special plumbing kit. 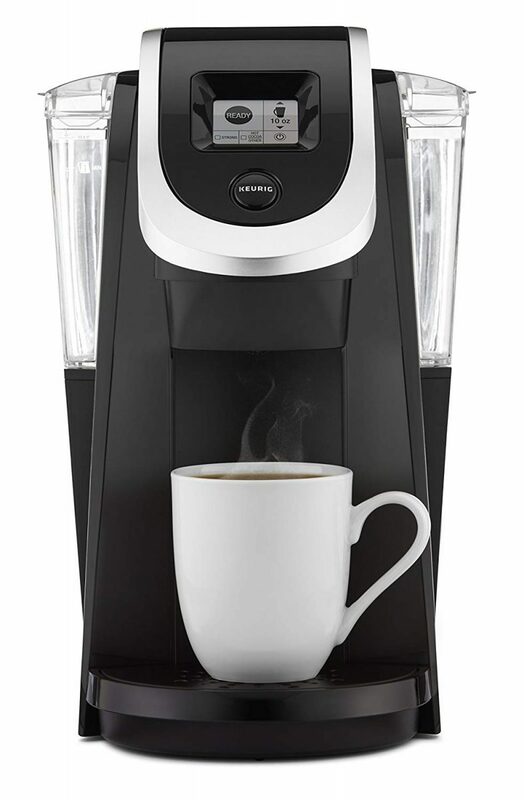 This Keurig coffee maker comes with a black & white touch screen and a removable reservoir (40 oz.) 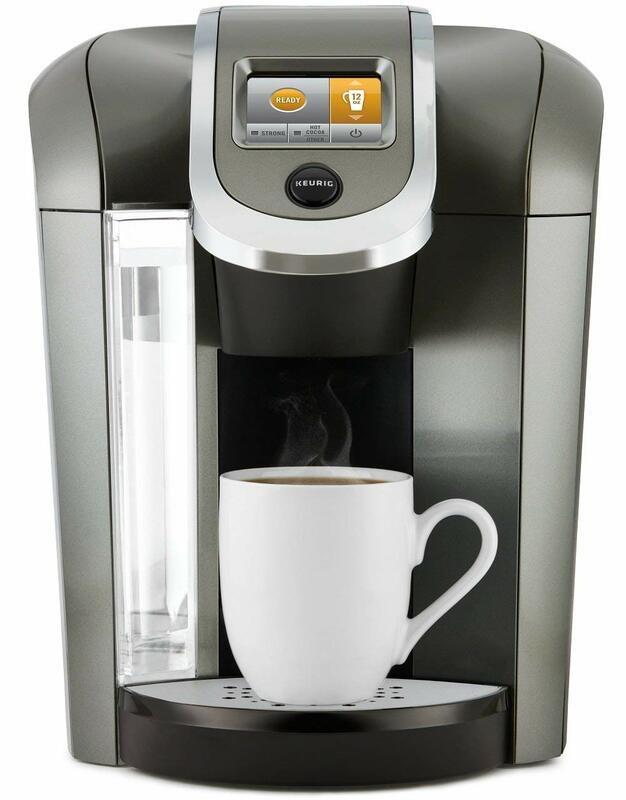 to let you brew at least 4 cups of beverage with various K-Cup (4-10 oz.) and K-Carafe (22, 26, 30 oz.) Pod sizes. The setting to control the strength makes it possible to have bolder beverages. However, you cannot control the temperature. By removing the pod and twisting the handle, you can have hot water. It has a removable tray for remainder drips and dishwasher-safe parts makes it easy to clean. Obviously, which Keurig coffee maker is right for you depends on the purpose for which you will use it. 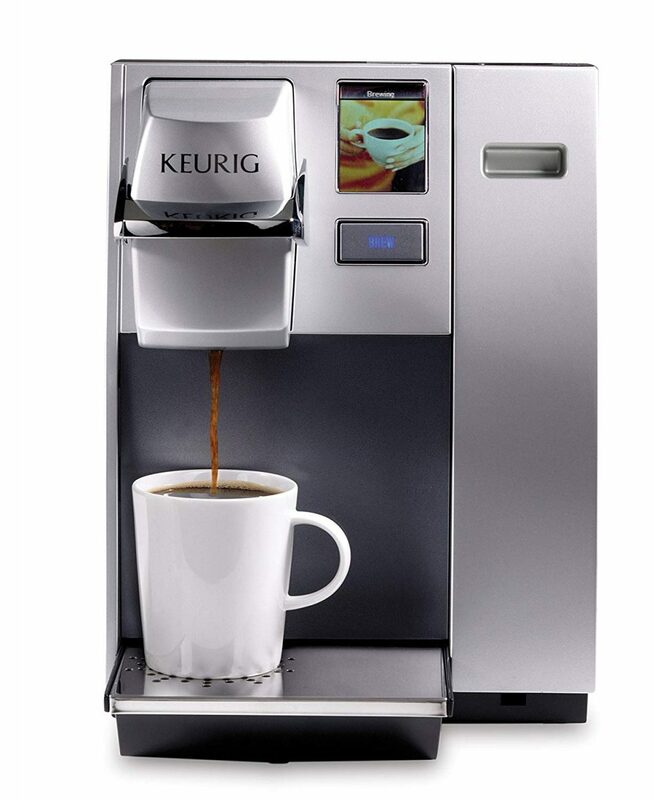 If you need one for the office, the Keurig K155 Commercial Coffee Maker is the way to go. If you need one for your airbnb property, the standard one will do. However, the winner of the best Keurig Coffee Maker (and the one I have) is the Keurig K575. It has a strength and temperature control. It also allows you to brew carafes of coffee for when you have guests so there is no need to have two coffee machines! Please let us know which is your favorite in the comments. You may also enjoy reading our reviews of the Best Latte Machines and the Best Grind and Brew Coffee Maker.